Every week, Your News to Know offers you breaking news about the economy and the market of gold and other precious metals. 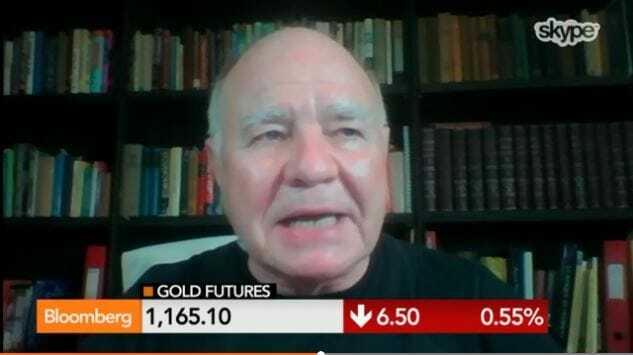 Stories this week include: Marc Faber says he owns gold because he doesn’t trust the financial system, gold rises again as the dollar drops, and gold coin sales surge as buyers seek bargains. “In the past 10-15 years gold hasn’t done that bad,” said Faber. “It has done actually better than stocks.” He also said that he likes gold because he doesn’t trust the financial system. REGAN: I know you have been bullish in gold for – well, pretty much forever, Marc. But now we’re in a situation where gold is at a four-year low. Goldman now predicting 10, 15 down. Soc Gen saying $1,000. Where do you see gold finishing the year? FABER: I would say Goldman Sachs is very good at predicting lower prices when they want to buy something. But that is a (inaudible) I would say, yes, we are down from $1,900 to $1,160 or something like this, and it’s been a miserable performance since 2011. However, from the 1990 lows we’re still up more than four times. So I just looked at performance tables over 10 years and 15 years. Gold hasn’t done that badly, has done actually better than stocks. Now I personally, I think that we may still go lower. It’s possible. I’m not a prophet, but I’m telling you I want to own some gold because I don’t trust the financial system anymore. I think the whole thing is going to collapse one day, and then I’ll be happy to have some assets. But of course the custody is important. I wouldn’t hold my gold at the Federal Reserve because they will lend it out. Gold prices went up Tuesday, boosted by a weaker dollar and expectations for higher demand from Asian bargain hunters, reported Reuters. The biggest support for the precious metal came from the dollar’s drop against the euro after a report emerged citing internal tensions within the European Central Bank (ECB). The governing council of ECB is divided over proposed policies on dealing with looming deflation in Europe, and part of the problem, according to Reuters, could be the “more tightly held” leadership style of ECB’s chief Mario Draghi. Appetite for gold coins surged in both Europe and North America, the biggest buying spree since April 2013 when gold prices fell by $200 in two days, according to Reuters. Coin dealers and mints in both continents reported a surge in coins and small bars that are preferred by investors. At Degussa, one of the biggest European gold and silver dealers based in Germany, activity was three times the norm, said CEO Wolfgang Wrzesniok-Rossbach. On Friday alone, the U.S. Mint hit its highest one-day sales of American Silver Eagle bullion coins since January 13 when the new 2014-dated coins came on the market. To keep up with to date with the latest news about gold and precious metals, follows us on Facebook.